Irish dancers give thanks for sock glue this Thanksgiving! For many Irish dancers, summer is when regional Irish dancing championship training becomes serious. School is out, and there is more time to practice and perfect those Oireachtas steps. Sometimes the hardest part about practicing is not understanding how to practice to your best advantage. Nothing is more frustrating than feeling as if no progress has been made in your dancing, even after a long time spent practicing. To help Irish dancers out there who are preparing for the Oireachtas, or any other dancing goal, I had the pleasure of interviewing Mary Moran, TCRG, founder and director of the Nashville Irish Step Dancers and an amazing and knowledgeable teacher! 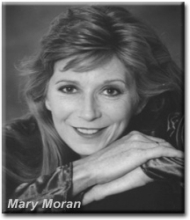 Ms. Moran has trained numerous dancers to reach their highest potential. Her students have won the Southern Region Oireachtas in both team and solo dancing, have placed in the top ten at Nationals and All-Irelands, and have qualified and placed at Worlds. Beyond a doubt, Ms. Moran can tell dancers everywhere just what it takes to dance like an Oireachtas champion! In this first part of my interview, the Irish dance instructor gives some helpful tips to improve softshoe technique and stamina. Softshoe dancing and hardshoe dancing can both be tiring; however, they use different kinds of stamina. Feis America: What are your suggestions for improving softshoe stamina, so that the first and last steps of a softshoe dance are equally powerful and energetic? Moran: For a warm-up alternate: a minute of hops, then a minute of plyometrics, a minute of hops, then a minute of jumping rope, a minute of hops, then a minute of jumping jacks and power jacks, a minute of hops, then a minute of jumping drills, a minute of hops, and then a minute of froggie-jumps. You are alternating five minutes of hops, with full lifting, to five minutes of jumping drills for springing…it works your stamina and teaches you to spring off the ground continually. I would also recommend dancing the third step of your reel four times in a row for stamina. When you are dancing three steps in a row, your stamina usually leaves in the third step. By running that third step four times in a row, you train that last step to be your strongest. 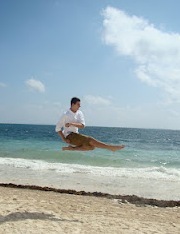 World Irish Dancing medalist Lockie Nidds practicing leapovers on vacation. Feis America: Leaps are one of the most common moves in softshoe dancing, but they are tricky and can take a long time to perfect. What is your advice for dancers striving to develop the perfect leap? Moran: There are four elements for me: First, momentum into the run. Second, launch into the ‘over’: up, locked, and with power. Third, form or perfect technique: locked, separated legs; squeezed toes; hang-time. Fourth, follow through out of the ‘over’ and extend into the next movement. Feis America: With lots of challenging aerial movements, softshoe dancing requires a strong upper body capable of holding itself upright throughout the entire dance. Unfortunately, many times the upper body is neglected as dancers work to achieve perfection solely in their legs. What are your suggestions for improving strength and technique in a dancer’s upper body? Moran: For upper body strength, work your core on a daily basis with pilates, sit-ups, planks, push-ups, and yoga. A strong core is key to controlling upper body problems. Feis America: For many dancers, the Oireachtas is the big finale of a long year of intense training. What is your advice for dealing for the stress and nerves that comes hand-in-hand with a big competition like the Oireachtas? Moran: The hardest obstacle to overcome is the “mental” aspect of the pressure dancers put on themselves when competing at a big competition. So much is at stake…they have worked hard for months to be judged on a few minutes of dancing. There are no second chances, and you have to deliver it strong the first time. It’s a lot of pressure. The most important thing is to focus and relax. It’s the hardest thing to do when you are feeling so much pressure, but by breathing and relaxing, it allows you to dance your best instead of tensing up. When you worry, it drains all your energy and holds you back from dancing your best. If you have done the work, you have nothing to worry about. Let go of the variables out of your control and just focus on what you can control: your own dancing. Have a set routine of what you do the night before and the morning of: do breathing exercises to physically make your body relax, say a prayer, and just do your personal best. Feis America: Thank you so much! Your advice and expertise will be greatly appreciated by many Irish dancers! Follow our Oireachtas Training series, and check back soon for the second half of this interview with Ms. Moran to get great tips on how to improve your reel or slip jig steps in time for the Oireachtas!